The famous February strike of 1941 was the only major protest in solidarity with Jews in Europe during the Nazi era, and has since been a symbol of resistance. Rose up for the people that lay under. On February 25, 1941, workers in Amsterdam went on a two-day general strike against the Nazi persecution of Jews. The months preceding the strike had been tense, with Dutch Nazi organizations harassing Jews in the Jewish neighborhood. 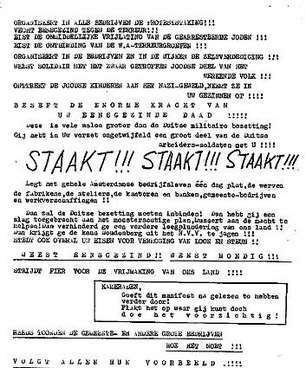 In response Jews (and non-Jewish supporters) formed self-defense groups, resulting in a series of street battles, in which one Dutch Nazi died. The Germans then sealed off the Jewish neighborhood for non-Jews. A week later, on February 19, a massive fight broke out in the Jewish ice-cream parlor Koco after the Grüne Polizei tried to enter but was confronted with a self-defense unit from the neighborhood, injuring several officers. In revenge, the Nazi’s staged a large-scale pogrom a few days later in which 427 Jewish men between age 20 and 35 were arrested and deported, most of whom died in Mauthausen concentration camp. Although the role of the Dutch Communist Party is downplayed in official commemorations, its role was instrumental. Taking their lead from the strike in the metal industry weeks earlier (which successfully blocked the deportation of metal workers to German factories), the communists called out and organized for a general strike on February 24 in the hope that this would show the German occupier that persecution of Jews would be too costly in the Netherlands and would work against their local allies (the NSB). On the morning of February 25, public transport workers were the first to strike, while communists were spreading the strike manifesto across work places in town. By noon the strike had paralyzed the entire city, and soon spread to the surrounding regions, from Zaandam to Utrecht. After two days of brutal repression – in which nine strikers were killed, dozens others severely injured, and many more imprisoned – the Nazi’s succeeded in suppressing the strike. Several strike leaders were later executed by firing squat. Although ultimately unsuccessful, the Amsterdam February strike will forever have its place in the history of antifascist resistance, and the brave men and women who risked their lives will forever be remembered for their bravery and solidarity with their persecuted fellow citizens. Protest against the horrible persecutions of the Jews! During the recent Saturday, Sunday, and Monday the Nazis behaved like beasts in neighborhoods with Jewish inhabitants. Hundreds of fully armed members of the military police suddenly appeared in the old city and in other neighborhoods and attacked helpless men, women, and children, while yelling, shouting, cursing, and shooting. Hundreds of Jewish youngsters were seized in the streets, thrown into police cars, and sent to an unknown place of horrors. This is the Nazi revenge for the brave self-defense that, two weeks ago, caused two Nazi riot “heroes” to retreat and the killing as a terrorist of the Fascist bandit Koot. This is the ugly answer to the anger of the masses and the massive protest demonstration of the citizens of Amsterdam against the pogrom carried out against the Jews. That is mainly the result of the great-capitalist “mediation” of Asscher, [Rabbi] Sarlovis, and Cohen, who, in their servility, agreed to shoulder the Jews’ guilt and attempted to defeat the continued adoption of defensive measures in the struggle, arguing that “calm” will now be restored. These great capitalists are afraid that a ransom will be imposed, and their money is dearer to them than the Jewish workers! The SS and the military police, whom even the German soldiers loathe, are carrying out this dirty work with genuine pleasure. Here the dregs and the chaff of the German people are at work. The stupid and lowly Dutch Nazis, the dregs of our people, who absented themselves in this case, should learn from this rabble how to impose terror on the working masses. These riots against the Jews represent an attack on all the laboring masses!!! They constitute the beginning of harsher enslavement and terrorism!!! They cannot but pave the way for the usurpation of rule by Mussert, whom every Dutchman despises!!! Proletarian residents of Amsterdam, will you put up with this? No, a thousand times no!!! Are you able and willing to prevent this disgusting terror in the future? The metalworkers in Amsterdam have shown the way. They struck in unison against their forced transport to Germany, and the coercive power of the German military administration had to contend with this resistance! In one day, the metalworkers triumphed!! So, do not let the jackboot of the German soldier intimidate you! Organize protest strikes in all factories!! Join ranks to fight against this terrorism!! Demand the immediate liberation of the interned Jews!! Demand the disbanding of the Dutch Fascist terror groups!!! Organize self-defense in factories and neighborhoods!! Show your solidarity with the Jewish segment of the proletariat, which has been so badly mistreated!! Spare the Jewish children from the terror of the Nazi atrocities; take them in with your families!!! Be aware of the tremendous might of your unified action!!! It is much greater than that of the German military occupation! There’s no doubt that many German proletarian soldiers support your resistance!!! Shut down all of Amsterdam for one day—shipyards, factories, shops, offices, banks, city hall, and enterprise works!! Then the German occupier will have to retreat! You will have dealt a blow to the monstrous scheme to bring Mussert to power! You will have thwarted the continued plunder of our land! You will have made it possible to oust Woudenberg from the trade union!!! Demand increases in wage and welfare benefits everywhere!! Stiffen your spine and fight to liberate our country!!!! 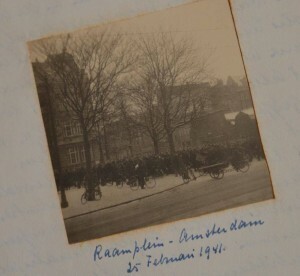 The only known photo of the February strike was recently discovered in the 75-year-old diary of a Keimpe Sikkema, who in 1941 was a young journalist working for the socialist daily ‘Het Volk’. The ROAR Collective publishes ROAR Magazine, an online journal of the radical imagination providing grassroots perspectives from the front-lines of the global struggle for real democracy.